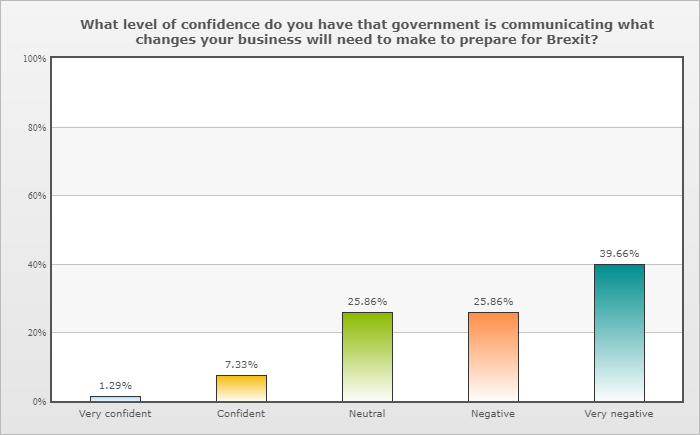 After a number of high-profile businesses raised the alarm on Brexit, Business West can now reveal that confidence among SMEs in the West in government to deliver a Brexit that works for business is on the wane. Business West’s quarterly Local Business Survey shows that only 11.69% of the 230 businesses polled in the West were confident or very confident that the Brexit negotiators could deliver a good deal. 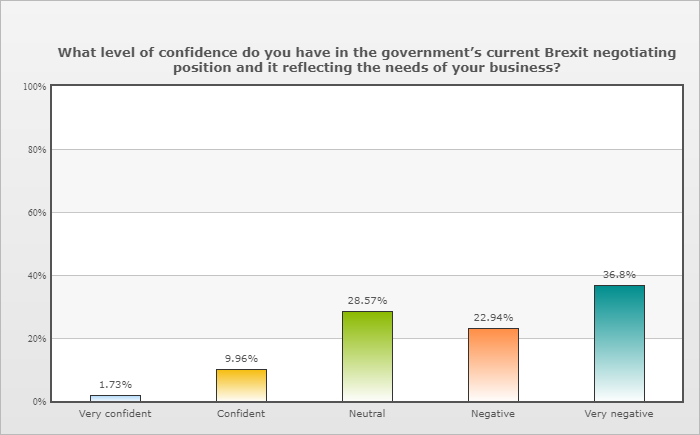 By contrast 49% of businesses said they felt negative or very negative about the negotiations. Not only were businesses cold on the government’s ability to deliver a pro-business Brexit, the vast majority also agreed that government had been less than forthcoming in terms of communicating how business needs to prepare for Brexit. A mere 8% of respondents said that they were confident or very confident about the information from central government, whereas a whopping 65% took a negative or very negative view. 1. Will I be able to hire EU nationals in future – and under what conditions? 2. Will business travel between the UK and the EU involve further administration, costs or visas? 3. Will my business be able to move skilled staff members between the UK and the EU in future? 4. Will UK firms and institutions be able to participate in European R&D projects after 2020? 5. Will UK projects be eligible for support from the EIB after 2020? 6. How will the UK replacement for EU Funds work, and how can my company access opportunities? 7. Will I need to pay VAT on goods at point of import? 8. Will I be able to use postponed accounting or have access to more generous deferment account terms to offset the cash-flow issues? 9. Will I need to become VAT-registered in every EU Member State where my firm has clients? 10. Which regulator will be overseeing my business in the future, and what rules do I need to follow? 11. Is the UK government going to charge businesses for the creation of new regulatory agencies in the UK? 12. Will conformity assessments on products conducted by a UK body will continue to be sufficient for the product to be sold on the EU market? 13. What dispute resolution and means of redress will be available to my business in the future? 14. What industrial standards will my firm need to comply with in the future, and will the UK stick with the European model that we have strongly influenced? 15. Will my business have to pay mobile roaming charges in the EU after Brexit? 16. Will my business continue to be able to hold and transfer data and personal information without any interruptions after we have left the EU? 17. Will I be able to continue trading without tariffs with the EU in the future? 18. What rules of origin will I need to comply with once the UK has left the EU? 19. Will I be able to UK and EU content to be counted as single origin, both when trading with the EU and with third countries? 20. Will my company still have access to markets on the same terms as now once we have left the European Union? 21. How will my business be able to contribute directly to future trade negotiations? 22. Will I still be able to fly people and/or goods between the UK and the EU after Brexit day – or could travel be disrupted? 23. Will my goods be subject to new customs rules, procedures and inspections at the UK or EU border in future? Could my shipments be held up and delayed? 24. Will there be new health or safety-related inspections at the UK-EU border that my company will need to deal with? 25. Will I need to do additional customs-related paperwork, including import and export declarations, when trading with the EU? 26. Will my business be able to become a ‘trusted trader’ to move quickly through borders in future – and what will the process be? 27. What, if any, procedures will my company face trading cross-border between Northern Ireland and the Republic of Ireland? According to the BCC, Theresa May’s government has managed to make limited progress on just 2 of the 27 issues where clarity is needed, and little or no progress on the remaining 25. Such a damning picture also seems to be echoed by a number businesses in the West who took the survey. Many businesses feel that a line should be drawn under internal political debate and that government should deliver urgent clarity on the practical, detailed issues that underpin trade. Otherwise the West will see a continued deterioration in investment intentions and confidence as the clock ticks down to October’s Withdrawal Agreement deadline. Alaisdair Mackay of Clearwater Advantage in Salisbury said “the hierarchical stance being taken by the EU in negotiations” and “the British government’s refusal to challenge it” for creating an air of uncertainty that is hampering business’ ability to plan ahead in terms of growth and investment. In the aftermath of June’s European Council summit – with little progress made in narrowing the gap between the two sides – and ahead of Cabinet deliberations later this week on the UK’s negotiating stance, Business West is clear that continued uncertainty on firms’ day-to-day P&L questions is causing a significant slowdown in business investment. As negotiations progress, Business West will be assessing progress against the BCC’s key questions about Brexit as well as closely monitoring sentiment among local businesses. “Over the past two years, businesses have been patient. We have supported the government’s drive to seek the best possible deal for the UK economy. We have given time, expertise and real-world experience to support hard-pressed civil service negotiators. We have brought local businesses and elected representatives and officials around the table to talk through their concerns. “Businesses have every right to speak out when it is abundantly clear that the practical questions affecting the competitiveness of their firms and the livelihoods of their employees is at stake. With less than nine months to go until Brexit day, we are little closer to the answers businesses need than we were the day after the referendum.